Many of us have been waiting for it for four years and it is that time again. The World Cup, which is the most-watched sporting event in the world, has begun. What we like most about the month-long event is the social aspect. It is not much fun watching World Cup soccer on your own. Family and friends gather to watch together and cheer for their teams and share the excitement of each goal and near miss. Food is a big part of such gatherings. Snacks are shared during the game and during the intermission between the halves. 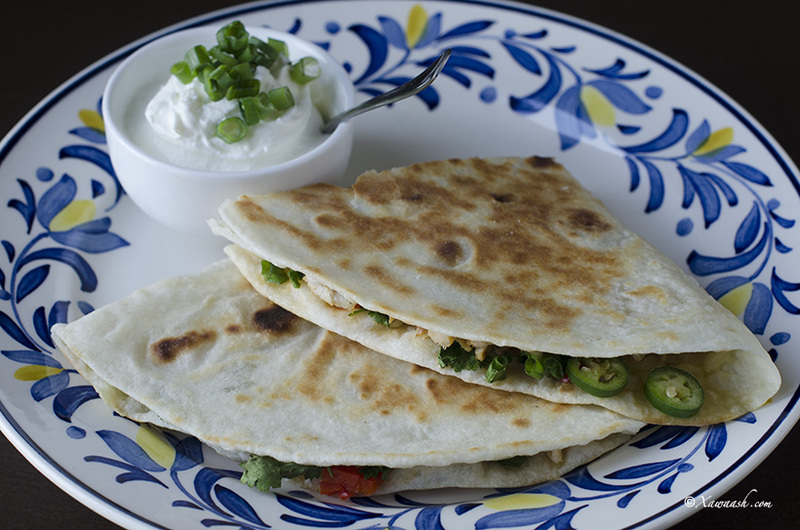 These quesadillas are perfect World Cup fare and will be a great crowd pleaser. We prepared them with two different fillings: one is vegetarian and the other is with chicken. Not only are they delicious but they are also quick and easy to prepare. They will also give you enough energy to cheer at the top of your lungs for your team. 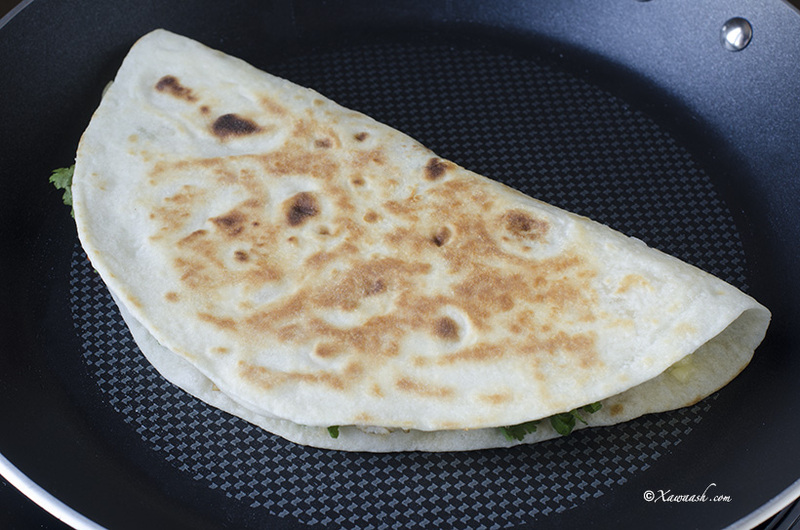 Brush one side of the tortilla with oil then flip it on a pan set over medium heat. Sprinkle all over with ½ cup cheddar cheese. Add the rest of the ingredients and finish with another ½ cup of cheddar cheese. Cover with the other tortilla and brush with oil. Flip after 4 minutes and brown the other side. 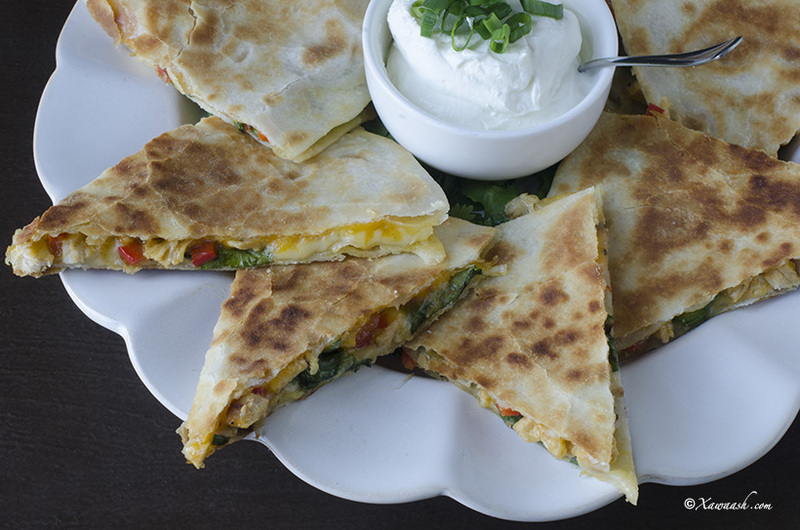 Cut into triangles and serve with sour cream. 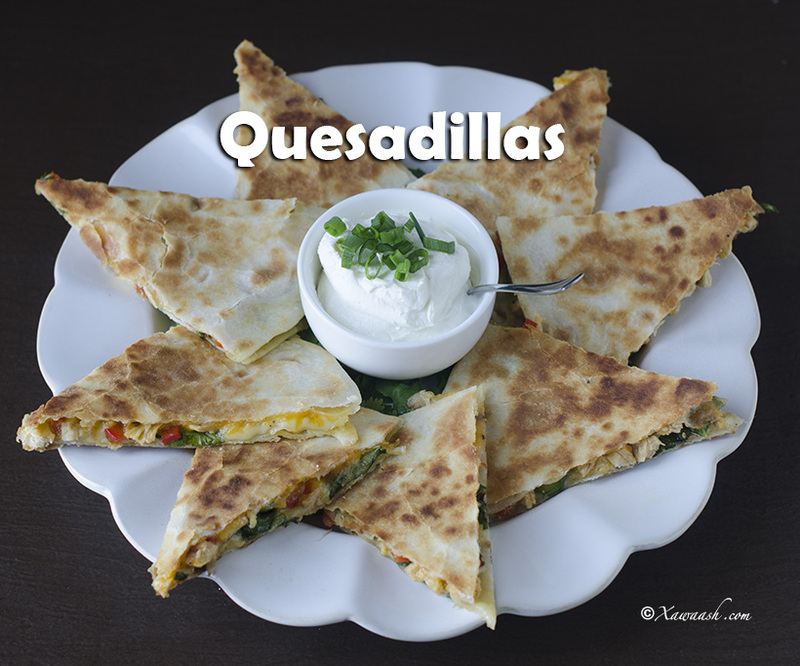 Sprinkle all over with ½ cup of the cheddar cheese, then place the rest of the ingredients on one half of the tortilla. Fold after 4 minutes then flip and brown the other side. 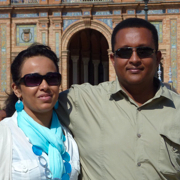 Tortiyaha hal dhinac saliid mari, kaddibna ku geddi bir dab dhexdhexaad ah saaran. Nus koob farmaajo korka uga shub. Ku dar mukawinaadka kale, waxaanna u dambeysiisaa ½ koob farmaajo sheedar. Tortiyaha kale ku dabool, kaddibna saliid mari. Geddi 4 daqiiqo ka dib. Dhinaca labaadna ka gaduudi. Saddex geesle u jar kaddibna ku qaddin kareemo dhanaan. Tortiyaha hal dhinac saliid mari, kaddibna ku geddi bir dab dhexdhexaad saaran. Nus koob farmaajo korka uga shub tortiyaha oo dhan, kaddibna mukawinaadka kale hal nus ku shub. Isku laab 4 daqiiqo ka dib. Geddi oo dhinaca labaadna ka gaduudi. Nous sommes nombreux à avoir attendu ce moment avec impatience depuis 4 ans et il est enfin arrivé. La Coupe du Monde, l’évènement le plus regardé au monde, vient de débuter. Ce que nous préférons de cet évènement qui dure un mois est son aspect social. Ce n’est pas trop amusant de regarder la Coupe du Monde tout seul. Familles et amis se rassemblent pour regarder et supporter leurs équipes et partager leur excitation à chaque but marqué ou manqué. La nourriture est une part importante de ces fêtes. Les gens partagent de snacks pendant le match et à la mi-temps. 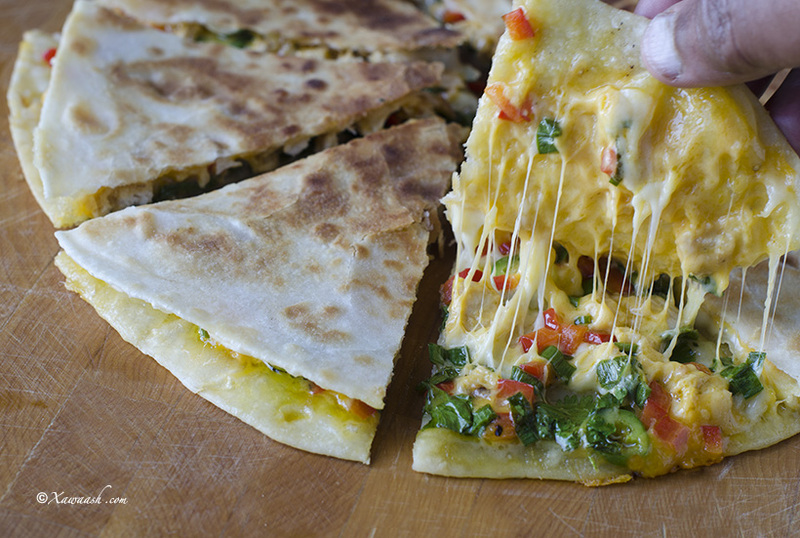 Ces quesadillas sont la nourriture parfaite pour la Coupe du Monde et plaisent à tout le monde. Nous les avons préparé avec deux garnitures différentes: une végétarienne et une au poulet. Elles sont non seulement délicieuses mais aussi rapides et faciles à préparer. Elles vous apporteront aussi assez d’énergie pour encourager votre équipe le plus fort possible. Brosser de l’huile sur un côté de la tortilla puis la retourner sur une poêle chauffée à feu moyen. Saupoudrer 1⁄2 mesure de cheddar. Ajouter le reste des ingrédients et finir par une autre 1⁄2 mesure de cheddar. Recouvrir d’une autre tortilla et brosser avec de l’huile. Retourner au bout de 4 minutes et dorer l’autre côté. Couper en triangles et servir les quesadillas accompagnées de crème fraîche. Brosser un côté de la tortilla avec de l’huile et la retourner dans une poêle chauffée à feu moyen. Saupoudrer la tortilla avec 1⁄2 mesure de cheddar, puis étaler le reste des ingrédients sur une moitié de la tortilla. Plier la tortilla au bout de 4 minutes puis la retourner et laisser colorer l’autre côté. Waa ku mahadsan tahay salaanta diiran iyo faallada wacan. Waan ku faraxnay inaad samaysan doontid Keesadiya, waxaanna rajaynaynaa inaad jeclaatid. Halkii koob caano fadhi waa 250g. Qiyaasta aan samaynay haddaad isticmaalaysid waxaa u baahanaysaa 3 koob caano fadhi. Sidaad ogsoon tihiinna koobka aan isticmaalno waa 237 mL. We thank you very much our dear sister, Amal, for your kind words. May God bless you. walaalayal waxan idiin ka codsanayaa waa hadad awoodaan farmaajo sheedar sidee guriga loogu samestaa?? Waxaa loo baahan yahay daawo Rennet la dhaho. Ma heli kartaa? I stumbled across your Youtube channel today and going through it, I can really say is wow and just felt obliged in sending this message of encouragement. I would like to say I really admire the quality content uploaded here showcasing your cuisine and country soo beautifully. The multi-translations, No music and music versions and easy to follow video recipes are fantastic and i’m in awe of the effort put in to maintaining your series. For me studying abroad, your videos have really inspired me in trying your recipes. I acknowledge both your efforts and much thanks. شكرا ياأخي والله ما في منهم ها الزوجين, الله يحفظهم ويبعدهم العين والحسد وانشاءالله تكون مرتاح بزيارة هاالموقع,واشتقت كمان بلدي اللي ولدت وتررعت فيه أهلا يا سعودية أهلا يا جدة اهلا يا عنا كش thank you dia brother really i missed Anakish and Shu’ara market ya allaaaah! Thank you very much for your words of encouragement. We feel touched. It is nice to know that the effort we put in this website is being recognized. May God Almighty bless you. Hi there, I have been waiting for the zi chuculata recipe for a very long time now, I really need to know how to make this. Thank you for your patience. It is on our to do list, and God willing, we will post it. Waa ku mahadsan tahay faallada wacan walaal. Basbaas maa ka waddaa mise soos la kariyey?